Francis A. Gregory Library, Washington, DC. Adjaye and Associates, 2012. Photo: Courtesy of Ed Sumner. Francis A. Gregory Library, Washington, DC. Adjaye and Associates, 2012. Credit: Ed Sumner. Francis Gregory Library, Washington D.C. Adjaye and Associates. Credit: Jeff Sauers. William O. Lockridge Public Library, Washington D.C. 2012. Photo: Courtesy of Adjaye and Associates. Credit: Jeff Sauers. William O. Lockridge Public Library, Washington D.C. Courtesy of Adjaye and Associates. Credit: Jeff Sauers. William O. Lockridge Library, Washington D.C. Adjaye and Associates. 2012. Photo: Courtesy of Ed Sumner. William O. Lockridge Library, Washington D.C. Adjaye and Associates. 2012. Credit: Ed Sumner. Bellevue Public Library, Adjaye and Associates. Credit: Jeff Sauers. “The future happens unevenly. It already exists somewhere,” said Ginnie Cooper. “Some piece of it is already happening. Who can you learn from?,” she counseled at a panel discussion about the “Future of the Library,” where she, David Adjaye, Nader Tehrani, Jeffrey Schnapp and Chris Bourg shared their insights with the MIT Libraries Task Force and the broader community. Throughout the evening, these esteemed architects, librarians and scholars discussed precedents in their own work that hint at this elusive “piece” of the future that “already exists,” as well as the ambitious work ahead for libraries to realize their potential as spaces for engagement, creation, reflection or refuge. “The stuff I do is as old as it gets. It’s still about weighty, heavy things that get put on top of each other to create funny things called enclosures. And we have these emotional relationships to these things…. My job is to put a spell on people to make them think that something is important, especially when I’m making cultural objects,” Adjaye stated. 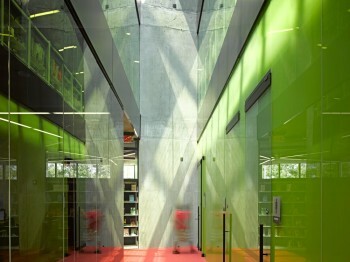 Since 2000, a number of libraries rank among Adjaye Associates’ global projects, including the Idea Stores in East London, the Gwangju River Reading Room in South Korea, and the Francis A. Gregory and William O. Lockridge/Bellevue branches of the District of Columbia Public Library in Washington, DC. In each of these projects, Adjaye says his investigation into the nature of the library led him to consider the notion of place-making and how spaces influence social behaviors. Adjaye explained, “The library moves from just being a depository of public knowledge, [because] the Internet dissolves that archive, and it becomes a place of socializing to gain access to both knowledge and network space, and a place to re-imagine different parts of the city and how it contributes to our public and civic life.” Thinking about the city as a whole precedes his thinking about any specific library building, he said: “I think if you go straight into thinking about the library, you may miss the point of how the circuitry of the city works. As behavior and density changes—as we’ve densified from little hamlets to large, metropolitan conditions—we’ve devised ways of continually making facades and voids which allow us to create collective moments.” Most city dwellers, who suffer from poor development decisions and who live in cramped apartments, can attest to the importance of creating libraries that function as extensions of home, work and recreational spaces, as Adjaye’s designs thoughtfully do. The Gwangju River Reading Room is a human rights memorial pavilion that draws on Korean vernacular architecture. Adjaye worked with the writer Taiye Selasi to imagine the library as a public staircase that leads from the street to the river. In this rich culture of reading and literature, he sought to “dissolve the notion of building into a place that could activate engagement.” The concrete and timber structure provides a gathering place for people to access books on human rights, use the internet, archive, store, share and trade information. Its experimental design, with cast concrete sealed bookshelves indented into the base and a porous timber roof, allows the pavilion to flood in high tide. With the Idea Store in Whitechapel—a culturally and linguistically diverse community—Adjaye set out to make a new kind of a library that would be environmentally conscious and would provide a different vantage point for Tower Hamlets’ residents to experience their neighborhood. The reading room along the perimeter of the building allows the patrons to face out to the active market street below, and the rooftop café has retractable skylights that create an outdoor courtyard. The building has a canopy that was devised to trap heat gain, but it also functions as a modern “public porch” that melds the building with the street. When asked why place remains essential when knowledge can be accessed from almost anywhere, Schnapp replied, “There are other senses involved when we actually are engaged in the process of training young people, of being a community of researchers and thinkers.” “Databases are not places,” he continued, “And I think the question about what a library could or should be today is a question about how databases intersect with local places and realities and stories.” To further this goal of sensory engagement, he suggested countering the ubiquitous hotspots with “cold spots,” or areas of disconnection from digital distractions. As substantial portions of libraries’ collections are born digital, Schnapp proposed using newly available storage spaces for curated content, perhaps from special collections. He also presented the provocative idea of “programmable stacks” that would facilitate the re-shuffling of collections to tell different stories. The “Future of the Library” was part of a series of events focusing on the work of 2016 McDermott Award Winner, architect David Adjaye, who will return to MIT throughout Spring 2016 as part of his McDermott Award Residency. Over the Dome, Killian Court, MIT. Photo: All rights reserved by MIT Image Library. Future of the Library panel, from left: Jeffrey Schnapp, Chris Bourg, Nader Tehrani, David Adjaye, Ginnie Cooper, Ana Miljački. Photo: L. Barry Hetherington.